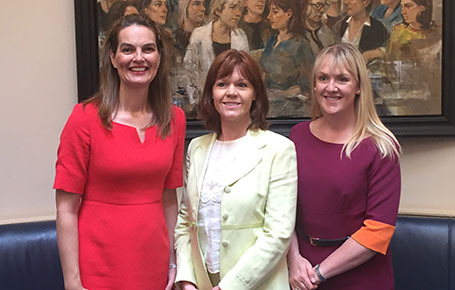 Home Economists from St Angela’s College were invited to address the Joint Oireachtas Committee on Children and Youth Affairs meeting on childhood obesity in Leinster House on Wednesday 30th May. Amanda McCloat, Head of Home Economics Department, St Angela’s College and Dr Elaine Mooney, Lecturer in Home Economics presented to the Oireachtas Committee on the contribution of Home Economics as a post-primary school subject in addressing the issue of childhood obesity. Calling on the Government tomakeHome Economics a compulsory component of Junior Cycle education, Ms Mc Cloat noted “prioritising the study of Home Economics in post-primary schools for all students is one of the most effective health promotion strategies available to combat poor dietary choices and unhealthy eating practices and consequently, assist in achieving the aims of A Healthy Weight for Ireland 2016-2025”. Dr Mooney referredtointernational research which highlights that learning to cook as a young person is positively related to cooking confidence, good health and diet quality in later life. She stated “Home Economics is the only school subject in which young people are afforded the opportunity to learn how to cook. It develops students’ practical food and health literacy skills empowering them with not just the nutritional knowledge but also the practical hand on skills to integrate healthy food choices into their own daily eating habits”. Amanda Mc Cloat noted that due to the practical nature of Home Economics, students engage in a practical hands on approach to preparing food. Important practical food and health literacy skills such as menu planning; shopping; cooking; health and safety food skills; portion control; reading food labels; dietary analysis; food budgeting; and food waste are also taught. Home Economics makes a unique contribution to the education of young people. While the solution to the obesity phenomenon is multifaceted, education emerges as a clear area of access. Home Economics is a comprehensive curriculum which teaches young people practical and theoretical aspects of food and the basic skills of how to prepare food for themselves and their families. Consequently, students will develop a confidence in choosing, preparing and cooking food. It’s time to wake up and get cooking!